As U-M instructors put the finishing touches on their fall syllabi, many are pondering technology policies for their courses. Instructors across all disciplines at Michigan have developed creative ways to utilize technologies to facilitate student learning. As many U-M faculty examples demonstrate, laptops and mobile electronic devices can be leveraged in the classroom to enhance student interaction, collaboration, content knowledge, and practice with key skills. Yet many teachers find the presence of such devices a hindrance to student learning in their classes and seek ways to limit their classroom use. Recent writings about this concern have cited the distraction of the student user, the distraction of their fellow students (with one faculty commentator comparing classroom laptop use to second-hand smoke), or the sometimes-alarming uses of social media among groups of students during class. Many faculty are also persuaded to limit laptops in the classroom by research on the benefits of notetaking by hand for those students who are able. Considering these concerns alongside the development of ever-better instructional technologies, what's the best technology policy to adopt? Interested in incorporating a new technology into your teaching? Looking for a boost to get started? Or a refresher on a technology you learned about at Enriching Scholarship in the spring? 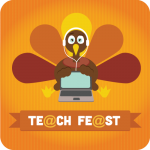 Join the Teaching with Technology Collaborative on Friday, November 21, for TeachTech FeastFest, a day-long series of 75-minute sessions on a range of technologies you can use in your courses. Sessions will allow participants to sample and share ideas about a variety of tools and techniques to enhance student learning through technology. Topics include: screencasting, transitioning to the Canvas learning management system, designing effective presentation slides, using videoconferencing to connect your students with guest speakers around the world, understanding the enhancements of the latest version of iClicker, and much more. Register here soon: sessions are filling up quickly! This fall, 18 U-M instructors are piloting the Canvas learning management system (LMS) as an alternative to CTools in their courses. The pilot of Canvas will expand to additional courses in the winter term as U-M evaluates whether Canvas is the right choice to be our next generation LMS. Canvas is available to U-M by virtue of our membership in the Unizin Consortium. Canvas includes many features that are similar to CTools, such as gradebook, assignments, quizzes, file sharing, and announcements. Canvas also has powerful tools for improving the teaching and learning experience such as integrated rubrics and peer evaluations. The Canvas SpeedGrader tool is proving popular among pilot instructors because they can view, annotate, comment on, and grade assignment submissions without downloading and re-uploading files. CRLT is currently interviewing the pilot instructors and surveying their students about their Canvas experience and how it compares to CTools. We'll share these findings with ITS and the Digital Innovation Advisory Group (DIAG) this December to inform next steps in U-M's exploration of Canvas. Learn more about Canvas and the pilot on the NextGen LMS pilot site. Online collaboration tools (OCTs), such as Google Apps, are revolutionizing workplace productivity and teamwork. They also provide tremendous opportunities to enhance teaching, learning, and course management. These hands-on seminars will allow faculty to develop plans for how they might integrate OCTs into their classes. To register for the seminar, participants will be asked to complete a survey on initial ideas they have for using these apps. In the seminar, faculty will have the opportunity to develop specific plans for their courses. Working collaboratively in small groups with colleagues, CRLT consultants, and IT specialists they will consider how OCTs can be used to accomplish specific course goals, such as improving team-work during group projects, increasing interaction in large lectures, promoting student dialogue and reflection, or facilitating collaborative authorship, editing, and peer review. No previous experience with OCTs is required, and the sessions are open to faculty at all levels of technical sophistication, for beginners to "power users." To register for the April 4th afternoon session, complete the survey form below. If you need more information on OCTs, please see this website. To register for the January 28th afternoon session, complete the two forms below. If you need more information on OCTs, please see this website.